It will be (maybe) a very short post. I just freed or escaped from deadline today. Hahahah. I will tell you something, recently I am looking for my favorite perfume and I do believe it will be a long long long journey. I don't buy fake. But I do buy something discount or I have to say that I will find some way to buy it cheaper. As you know perfumes from designer are extremely expensive. They are around $50 or higher and it is frustrating. Even for such 4 ml miniature you have to pay for $10. When everyone start to use the same perfume, it indicates that you have the lovely one, but when it happens, your identity starting to fade out. I think it is such a cliche. But I feel it. And it is frustrating to search for the new one. So here I start the journey (and it is starting to be a long post, I beg your apologize XD ). As we know, perfume company always produces like, let's say, some kind of type of perfume: 1. The perfume with its original size, it cost you something around $50, or if you lucky you will get some discount in the store. 2. The perfume miniature, it has the same perfume, 100% excactly the same thing that you will get if you buy original size, including the box and the bottle. It is cheaper, but if you buy 50 ml for $50, then you have to pay for this 4 ml for $7 to $15 and it is nightmare! Take your calculator. It is way more expensive than the original one! And the last. 3. Vial. It is one cheaper for sure and it suits me who are looking for new scent. It cost you some around $1.5. Vials usually come with those thin bottles contain about 1 up to 2ml perfume. When you think it is only can be use for one time or twice, well, better you rethink. My boyfriend use single vial for four time, he sprayed it everywhere! Hahaha. But, I can use it for a week or more. So it depends on how you use it. Hahaha. 2. CK Euphoria for Men it is for my boyfriend, He is using CK One Free for Men. But compared to this one. His perfume has better staying power. 3. CK Sheer Beauty it has sheer soft scent. I like it. But still like it only, not love it. 4. 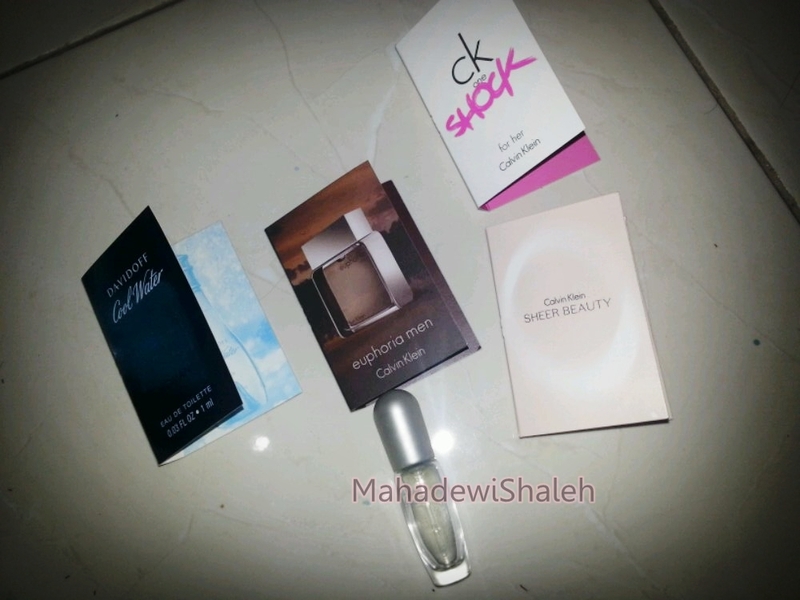 CK Shock for Women, it has sweet lovely smell. But I hope it can be softer and it will be my new holygrail perfume. 5. Estee Lauder Pleasure for Women, this one is miniature 4ml. It has to strong Citrus. Long time ago I love CK One Summer (2004 if I am not mistaken) I love it so much. But this one has too strong citrus and I don't really love it. Well I like it and wear it. Next month I will search for another Vials (it means another journey). So, see you again Girls!